Easy to use, quick drying, everyday cleaner to swiftly lift and remove grease, sweat and dirt from leather tack, leaving it clean and ready to be conditioned. Easy to apply glycerine based saddle soap with citronella. Smells amazing! For use on leather tack to clean and protect. Mother Bee Leather Balm is a luxurious conditioner for all types of leather, from sofas, bags and boots to saddles & bridles, it feeds and gives leather a new lease of life. 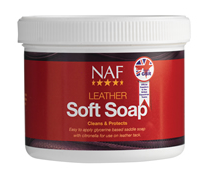 Pure, clear soap containing coconut oil and glycerine to soften, preserve and condition saddlery leather. Dispensed in a tray. Treats old leather and softens new leather. Blended for spreading and ease of use, even in colder weather.